Robin Wyatt Dunn is anything but a simple poet. I have followed most of his poems and progress over time and I consider that his writing reveals a poet of intricate complexity. I think it would be impossible to attach a specific label to him or to try to frame his poems in a specific literary current. Dunn is a versatile poet who easily dons different authorial masks for each occasion and thus treats a variety of themes without the pitfall of repetition and personal cliché. 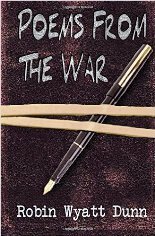 His poems, and specifically those in his book Poems from the War, reveal a poet of a rebellious nature, as well as Dunn’s frustrations when confronted with inequality, which is a constant in the contemporary world, and in his poems. They also reveal his impatience with the present capitalist society. The often short, poignant poems bear a striking resemblance to Victor Hugo’s Paris incendié, written over a century and a half ago. I think that Dunn tries to raise awareness through most of his verses, to make the ordinary person open their eyes and shout out: “This is enough! It needs to stop! Now” and the poems gathered under this title fall in that category. The second half of the book, however, treats two other preponderant themes: love and the loss of innocence. The poems are not titled and I strongly believe that any titles would have taken away from their intensity. Geographically speaking, the action takes place in California, in the Berkeley area – which is significant since Berkeley is the oldest Californian University, and Dunn actually seems to have written a manifesto against old structures. The tone alternates: aggressiveness is followed by melancholy and regret, which speaks to the poet’s ambivalence. He wants change but not the violence usually associated with it, which is starkly ironic given the title of the collection, evoking the violence of a battlefield and alienation. There is no uniform structure to the poems throughout the book. Long verses or stanzas are followed by one-verse poems, which only contributes to the impact of words that vary from strong and brutal to sweet and calm. A you that resembles you but is more powerful. More functional and less distinctive. How can there be an aftermath to something like this. get on with it, with what’s next. the burden of our tale. He is also aware of what can be found as the basis of the people’s evolution: I realize this is how barbarians feel, on finally entering Rome. Innocence is killed in a war and Dunn exposes this aspect in a poignant manner, showing the orphaned child whose parents they kill. Inside the apartment we kill the parents. And if I can clean her, I can clean myself. I can wash myself of all our sins. We make love under the jungle gym. “red hand” – the blood on his hands, “glad mind” – the euphoria of being in the middle of what he wanted, these seem to clash but the punch is stronger because of that. What horizon had I wished for? The end of the book is as strong as the beginning. In the last few verses, Dunn concludes with what is left in the ashes of a revolution. I take this book to be a strong manifesto. It is full of symbolism: the location, Berkeley; the orphaned child; the presence of Peter Pan and Wendy, to name just a few. I particularly enjoyed the manner in which the poet used repetition to drive a specific idea home. It provoked confusion and regret, not only determination, and thirst for revenge. However, the way he showed the evolution of love during the war and how he hinted at the loss of innocence and humanity saddened me. The reference to falling through the hole into Wonderland, as well as the mention of his lover’s death touched me and made me think.